Helentown has been a great place to live since the 1820's and contains many fine examples of Queen Anne, Italianate, and Greek Revival architecture. Helentown was added to the National Register of Historic Places in 1987. 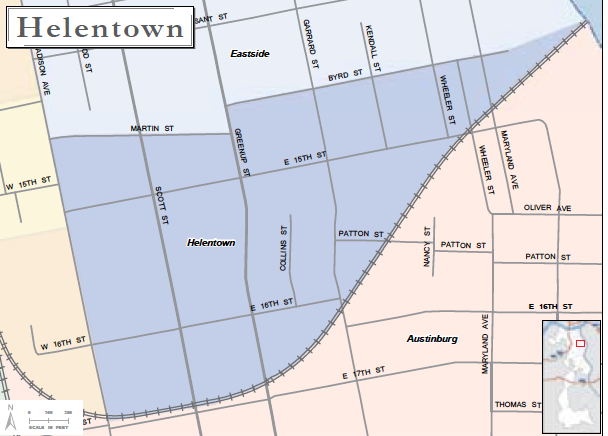 The neighborhood was formed in the early 1820's by mostly working class German Immigrants. In the early 1900's, the consist of the neighborhood began to diversify with more groups moving into the neighborhood with many different heritages and cultures, which is still reflected to this day. The Helentown Neighborhood Association meets monthly on the first Wednesday of every month of 6:30pm at the Life Learning Center on the corner of 15th Street and Garrard St. The Helentown Neighborhood Association recently formed and held its first meeting in August of 2007. Current projects are neighborhood beautification, encouraging neighborhood comraidere (annual summer picnic), and applying the principals of Crime Prevention Through Environmental Design (CPTED). The strengths of the Helentown neighborhood are diversity, friendly neighbors, great location and architecture, and the opportunity to capitalize on improvements being made by a neighborhood that cares.